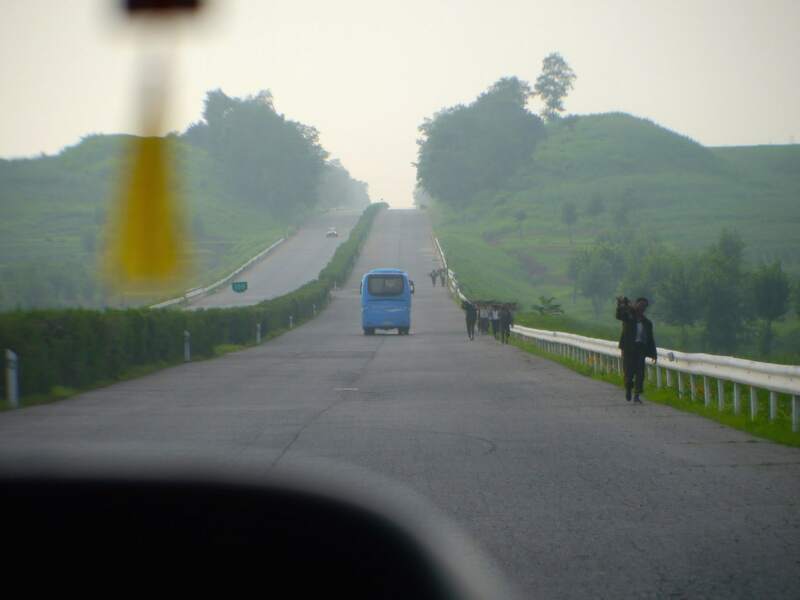 My North Korea Tour: Observations of Life in the "Hermit Country"
I am shifting on my window seat, trying to keep my eyes on the potholed road in front of us to anticipate the next bump. But it is impossible. Our driver is experienced, he has probably zigzagged along the cracked road many times before. 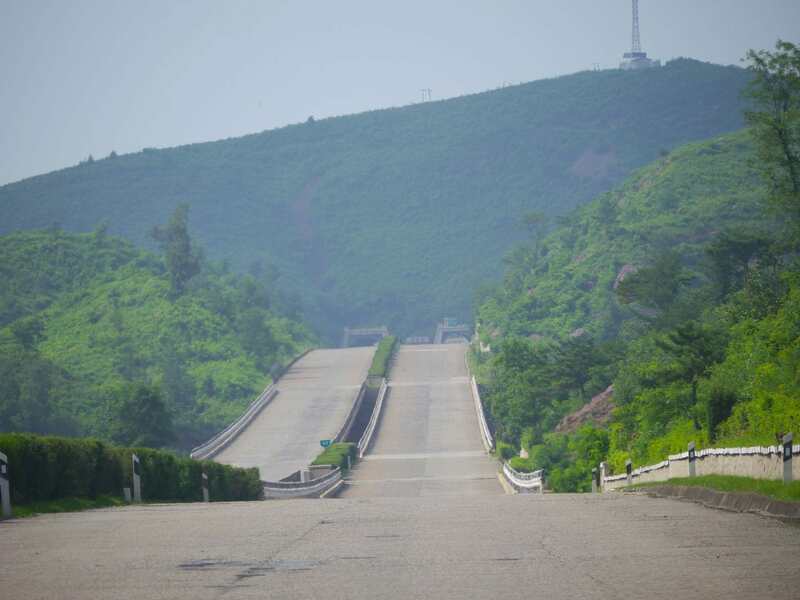 He swerves, right and left, at the last minute, to avoid a hole in the asphalt but there are too many, practically no section of this 160km road to Kaesong is smooth, and we unavoidably sink into the void and fly above the bumps. When my eyes are not to the front I hold my camera steadily, trying to shot scenes of rural life and record what I can through my 200x zoom. But, just like with my efforts to preempt the road hazards, I fail miserably. Almost every shot is blurry and I am unable to focus on any of the overnight watch huts dotting the corn plantations . 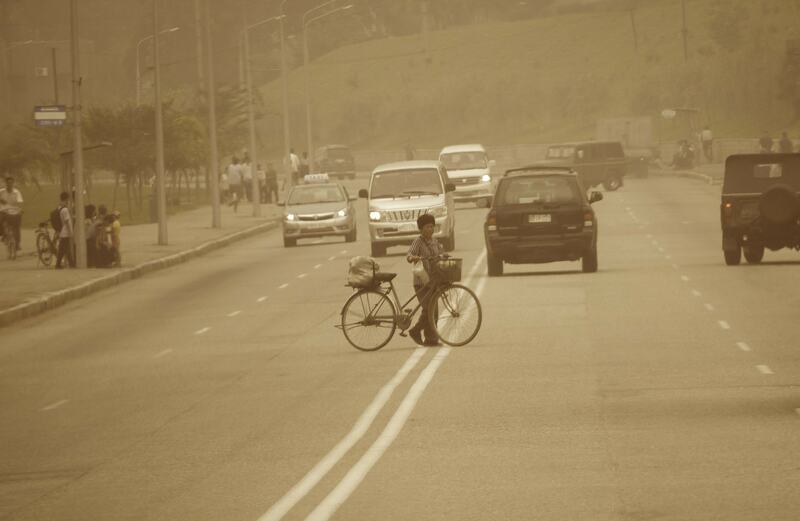 I do not manage to snap a portrait of rural life in North Korea either, men and women pushing their bicycles up hill, loaded on both sides with produce; groups of farmers working the cooperative fields; road workers cutting thin pieces of grass growing through the cracks on the pavement with paper scissors. Since we left Pyongyang all I can see are fluorescent green rice paddies, and corn fields. “How can this country suffer the famine and draught that is being reported all over the media with such fertile land?” I ask myself. The fields may look lush but the rainfall this year has been lower than expected. We visit in the rainy season yet it rains only one morning in the seven days we are in the country. The rest of the answer to my layman question may be in front of my eyes. Peasants that will never become farmers, slowly lift hand sickles to cut the weed. The rice is waist-high, peacefully growing towards the sun, and the small frames of the squatting villagers get lost in the lush greenery. We see no tractors, no cars, no trucks, only the occasional ox-cart pulled by an old and tired animal and its owner, under the scorching humid sun. “We never eat beef,” Clarifies my guide, “It is too expensive and the animals are used for agriculture instead”. Entire families help in the fields to up the productivity and starve hunger. Children, women and the elderly, indiscriminately, helping out in this self-reliant, subsistence-driven country. 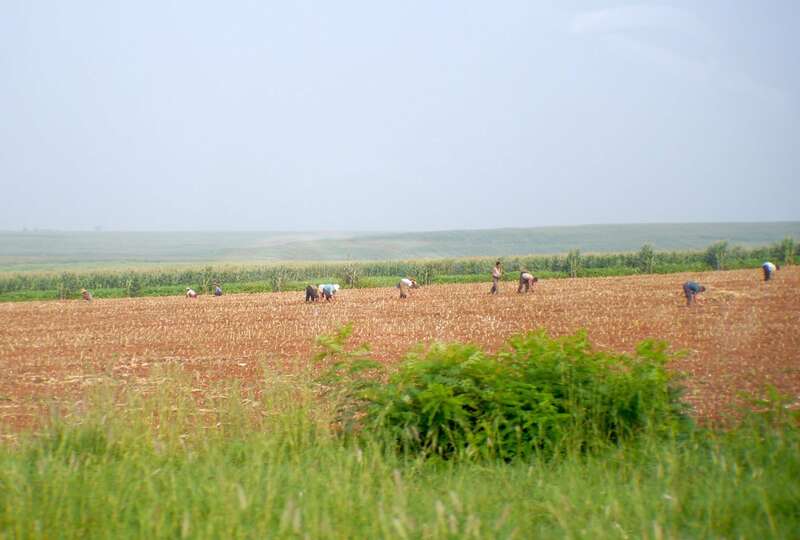 The plains and hills around Pyongyang are fertile, criss-crossed by clear streams and rivers, but productivity is low and these water sources once used to carry a deeper flow. These fertile landscapes are a mirage. 80% of the country is mountainous and unsuitable for any farming beyond simple grazing. Occasionally, we see a small and loud engine churning through the bitumen, attached to a tiny cart and moving construction materials along the road. Patch work along the paved roads is entirely manual, like trying to sew a gigantic sweater with tiny needles. Famine and malnourishment killed thousands in the 90s. As a result of natural disasters, a subsistence agriculture fully reliant on the staple foods and lack of mechanization, many children and adults in the most impoverished areas perished. This year, the UN World Food Program is predicting a sharp decrease in rice production too. In the 90s, the UN and long-term enemies Japan and South Korea, sent food aid but the country’s isolation and pride did not allow it to publish real figures on affected population and upwards of half a million people died. The country’s isolation also limits the amount of foreign aid workers. We see only one UN car and one Swiss Aid organization’s SUV in the entire trip. In other famine-stricken parts of the world, shinny aid cars are everywhere, but here, they are as scarce as the rest of the vehicles. To fight famine, villagers have started to develop systems of self-reliance, not on the State, a Juche Idea concept that is fervently drilled into my head in every Museum, but in themselves. We see elderly women sitting in the shade, next to a basket filled with apples available for trade. Particularly in the rural areas, having foodstuff to exchange with the neighbor can mean the difference between having food in one’s stomach and going to bed hungry. By the side of the eight lane road we see groups of soldiers, their shirts untucked, their greying undershirts blackened by the dust and sweat. This is not the image of tidiness that we have seen in the city, in the countryside, life is tough and clean clothes rare. Soldiers from the world’s 4th largest army are used for the most menial of tasks. They prepare the sticky mixture to fill the potholes with their bare hands. We have to avoid driving over small perfect mountains of the patching material as if we were in an obstacle race. Despite the state of disrepair in which the roads are, we spot North Koreans swiping the edges with straw-brooms, as if they were taking care of their backyards. The 100-day flower, in full bloom, has been planted and tended to beautifully by the locals along the length of the road, splashing dashes of red, yellow, purple and orange on an otherwise grey and green landscape. We spot groups of peasants that look like they are being supervised by soldiers, perhaps they are prisoners condemned to forced labor. The paranoia and the grim reports in the media make me see the worst in everything. Among the green tall rice paddies and the corn stalks reaching towards the sky we see red flags and socialist propaganda messages. The red flags indicate places where reconstruction or repair works are taking place. They are meant to attract laborers to help out. I ask the guide to translate the billboards and she always repeats the same encouraging and celebratory socialist messages along the lines of “Let’s all rise and work for the future” or “Let’s work together for the Revolution” or “Cheers to the Three Revolutions”. More often than not, soldiers, workers and peasants are resting. Sitting down by their bicycles, their hats off, they are relaxing in the shade, perhaps having a snack or drinking some water. The Party would not be happy if such images were divulged, they dislike photos of soldiers taking a rest, work is redeeming. At a service station, we drive past four soldiers tucking into warm watermelon. To open it, they dropped it on the hard concrete. Seeds, juice and tiny pieces of the sweet fruit are scattered around them. Squatting on their knees, they use their dirty hands to devour this luxury. After a week in the country, what I miss the most is fresh fruit. What little fertile land the country has is entirely devoted to rice, corn and potatoes. We see the occasional apple tree and this is the only fruit we can find in the supermarkets in Pyongyang. Back at the service station, the soldiers stare at us, bemused perhaps, curious, even smiling. In the city, locals are stoic and stern-looking. Nobody stares at us, as if their mothers had told them it was rude, but we do see them furtively looking through the corner of their eye. One morning, as we walk up the stairs in a crowded metro station, I unexpectedly turn around to take a final shot of the platforms only to find the entire station looking at me. 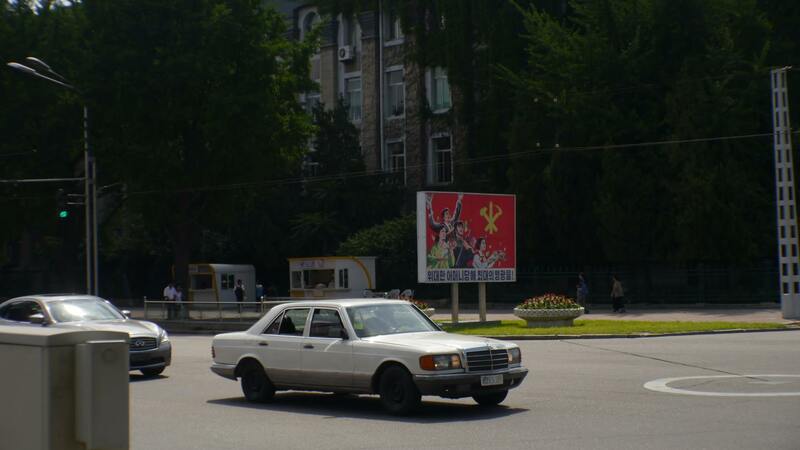 The roads are absolutely empty, yet in Pyongyang, we can see expensive Western cars picking up guests from the Hotel. I ask my guide if normal people have cars. “No!” She exclaims at once, as if I had asked something utterly ridiculous, “Only companies have cars, we cannot afford them”. A car costs $10,000, she tells me, and a teacher makes $150 a month. The city has public trams and buses but, in the rural areas, the only transportation available are one’s legs and bicycles. To make matters worst, we are driving on Sunday, the day of rest, when cars are not allowed on the road. Perhaps ridiculously, to enforce this rule, there are road check points every so often. And, at every post, we are pulled over so the police can see us tourists and let us go through. Tourists, taxis and soldiers are the only ones allowed on the roads on Sunday. We have been driving for over two hours when the sun starts to come down. At twilight, the ample empty roads look apocalyptic. Miles and miles of solitude only disrupted by the odd peasant riding a bicycle, carrying the fruits of his labor. Images of rural Africa flash in front of my eyes. 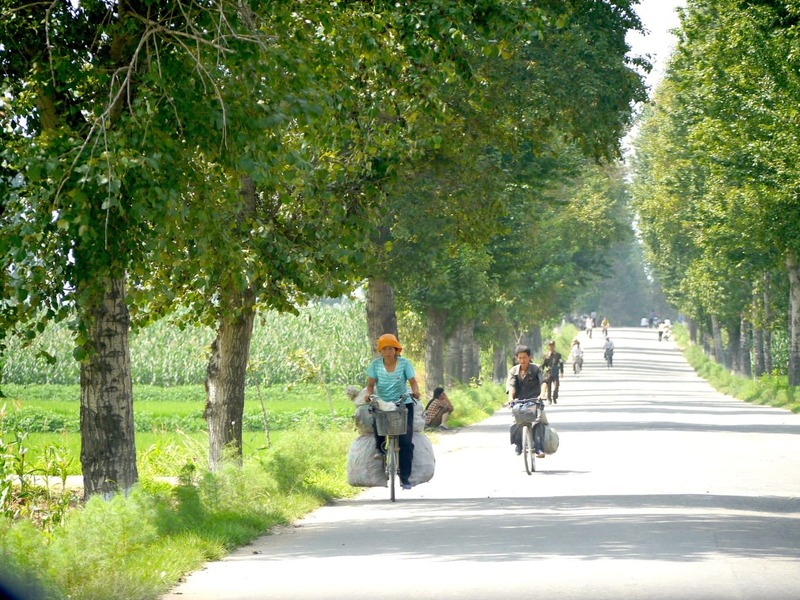 Instead of large bundles of vegetables balanced on their heads North Koreans strap huge packages to their backs or, the lucky ones, to the back of their bikes. Life happens at a slow pace, hours wasted trying to reach places. Those taking a rest by the side of the road look exhausted. We drive for 160km from Pyongyang to Kaesong and we pass by very few inhabited enclaves. Villagers must ride for hours every day. The basic diet low in protein does not help. “We usually eat meat two or three times a week,” responds my guide when I sight that I can’t finish my meal, once again. At every sitting, we shamefully leave more than half of the food on the table. But no matter how hard I try to eat everything we are served, there is always more coming. Meals always end with soup and rice, after a dozen of other dishes, just for the two of us. I learn, after the second day, that even if my guide says that there is no more food coming, soup and rice are considered the final condiments. I can’t help but feel that they are making sure tourists do not dare to question food scarcity. At every lunch or dinner, our table is always separate from the rest of the diners. Often times, we are placed in a private room or behind a screen so we cannot see what the others are eating or how big their portions are. On my way out of the restaurants I see empty plates on other tables and I can’t help but wonder if they got as much food as we did. It would be impossible for a regular person to finish the large amounts of tofu, kimchi, salad, deep-fried tempura potatoes, roasted chicken, bean sprouts, rice, meat soup, duck, stir-fried vegetables and the bibimbap that we are offered at every meal. 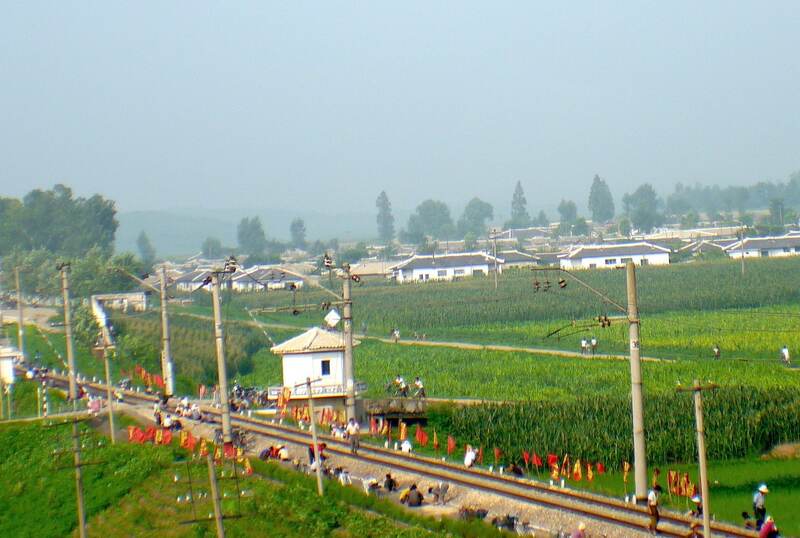 In a saddening contradiction, North Koreans are slim in the cities, skeletal in the rural areas. In the six days we are there I only spot one “fat” local. Soldier’s tiny frames get lost in the large socialist army uniforms and standard shirts. Shoulder pads are twice as wide as the average person and the hats often fall to their eyebrows, held in place by the few hairs instead of the forehead. For some, joining the army is a way to ensure food on the table, despite reports that the Party can longer feed the soldiers either. North Koreans have been found to be smaller than their Southern counterparts by as much as 8cm due to poor diets. Our guides are the same height as me, but in the countryside, people look dwarfed by the weight of their existence and the lack of opportunities. It is clear that the guides are chosen by their social class and their appearance. They are good looking, educated, immaculately dressed and coming from the highest class: their parents are doctors, army officers and teachers. I can’t help but notice that our female guide is constantly fixing her hair and make-up, every time we get back on the car. The summer is in full swing during our visit and, although it is Monday, we drive past a popular river on our way to the border with the South. The Colonel that is escorting us and who will be our guide at the border, smilingly points at the dozens of villagers taking a dip in the river waters. Colorful umbrellas, makeshift tents made of plastic pieces hanging from wooden sticks provide shade to the less fortunate and everyone is wearing the democratizing swimming costume that comes in just three colors. 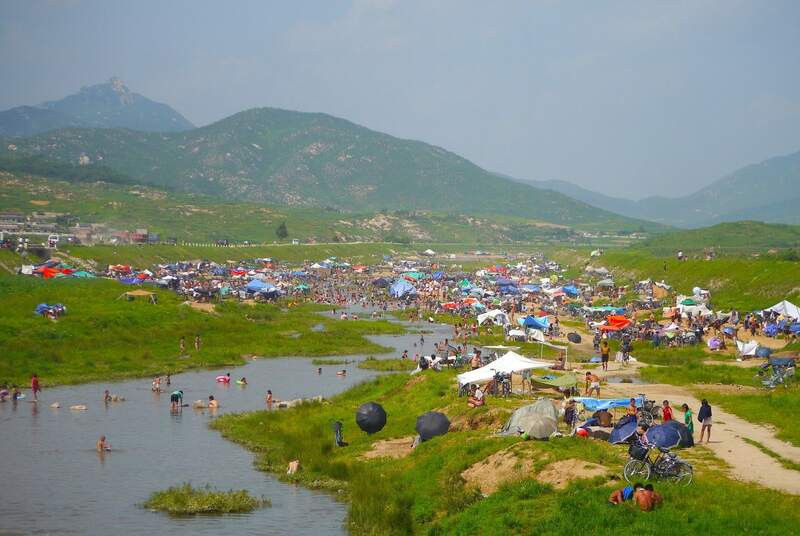 Children and adults are playing in the grassy shallow waters, others are washing their clothes. It is a lively and commonplace scene, we could be anywhere, but we are decidedly in North Korea. There are no cars in front or behind us and the ever-present white washed houses pop up in the background. The water is muddy and I am certain the Great Leader would not want the tourists to see such sights. Most tourists go to the DMZ but do not venture this far into the countryside to climb up a hill and look down into the South Korean Army posts and the concrete wall erected to separate the two countries. Despite the hardship and the obvious lack of basic items villagers smile more, they interact more with each other, they seem to be more connected, with a larger soul. They have replaced the formal shirts for singlets and open shirts and are less concerned about getting a tan, their browned faces to the sun, save for the commonplace hats that look like they are used to protect from the heat rather than to maintain a whiter tone. On the last day, we veer off into an even more forgotten part of the country, driving through gravel roads that lift so much dust you cannot see the oncoming military trucks. 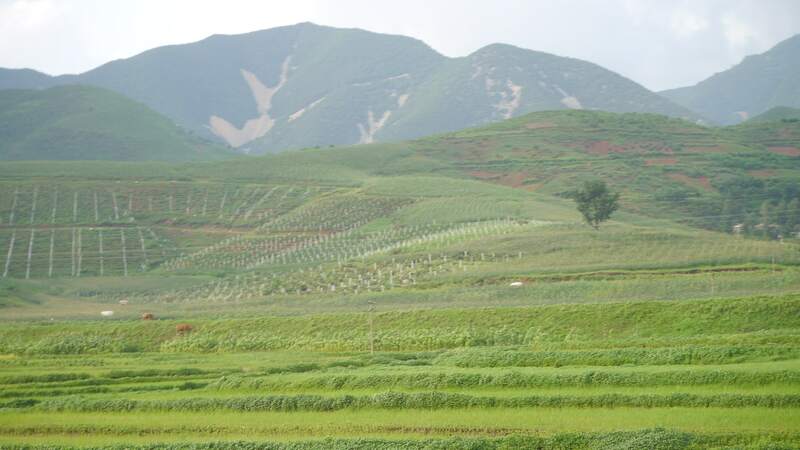 This is genuinely rural North Korea, the true image of a society that has been isolated for 70 years after many decades of occupation and under-investment. Basic brick houses with the usual socialist construction style dot the pastures and crops. White walls have turned the color of desert sand, as have the apples for sale by the side of the road. Trade is surely illegal in a socialist society, but it is too far from clinical Pyongyang and the Party is afraid controlling illegal trade may cause an uprising and more starvation. I can’t help but feel that tourists are not meant to come this far. Our guides have never been here before and I half feel that we are in no-mans land, at a lost enclave tourists are not supposed to see. Bicycles are still pervasive but there is an increased amount of people on foot, traveling home from the fields, with their hand sickles hanging from a bundle of large pieces of wood strapped to their backs. The hills are lush but hide many a secret. As I am scrutinizing the landscapes and watching the movie of life go by, I spot anti-aircraft guns on the top of the hill. My friend and I mumble at each other, “Have you seen up there, in the hill? Is it what I think it is?”. For the first time, I am scared. Scared that we might be somewhere no tourist has been before and frightened that we might have strayed from the well-traveled tourist route. Our guide does not seem to have noticed our increased heart-rate when we spot two other groups of guns, no soldiers around them. We find ourselves looking the other way, making sure nobody can see us looking at them, if we haven’t seen them we hold no secrets. As we finally reach our destination, after two failed attempts and a U-turn, I realize it may have been an oversight on our driver’s part, as he took the wrong turn and drove us farther into rural life than we should have been. What would have happened if an officer saw us where we were not supposed to be? Back in the city, traffic has resumed its regular pace and trams and buses fill the streets again. The limited interaction between people and cars creates unreal situations: pedestrians never have right of way and they are often found crossing the street, randomly, as if they did not understand the risks associated with cars. They never look for oncoming traffic before stepping onto the pavement, they don’t use the pedestrian crossings and they do not seem to be able to understand the speed at which cars travel, constantly underestimating the time it will take to reach them and finding themselves trapped in the middle of the road between two sides of oncoming vehicles. Cars are a distant reality. As we walk from the van into a bookstore I realize that this is the only time we are on our own two feet in urban Pyongyang. It feels strange and adventurous, but the walk is a mere five minutes. We pass by a playground. Children play noisily. It does not matter where you are, children will be children. I am asked repeatedly, by friends and acquaintances, if I felt the trip was staged and my answer is a rotund no. We are shown the best restaurants, given abundant food and beer and our guides are an example of the best Koreans there are: eloquent, solemn and parsimonious. Each word to come out of their mouths is scrutinized for perfection. They are precise, to the point of obsession, although, when asked a question that is outside of their memorized script, they sometimes cannot find the right words to speak plain English. The Regime is tough and oppressive, it is paranoid and indulgent to the Leaders, the true image of Orwell’s 1984, complete with music playing loudly through Pyongyang at 5am every morning. 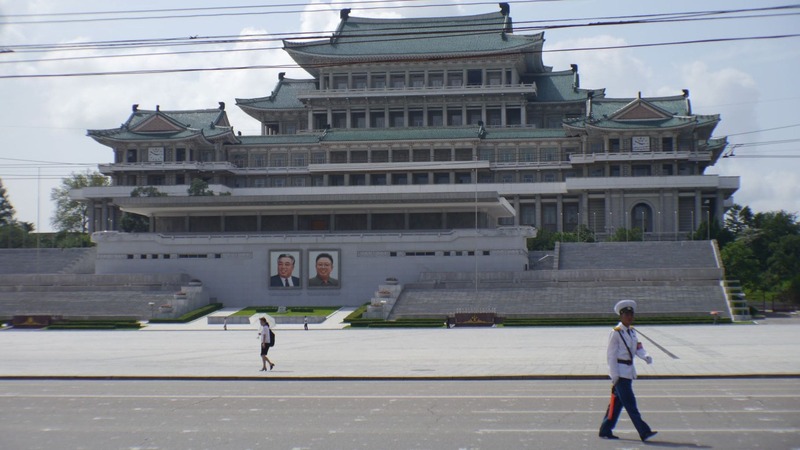 The names of Kim Il Song and Kim Jong Il are mentioned dozens of times every day, as are their photos, decorating the walls of every official building. In a country with such political adulation, the importance of an official building or place of interest is measured by the times each Leader visited it. After just six days I am starting to feel a mild Stockholm syndrome. But the feeling is not that of being in the Truman Show. We did see the raw, unadulterated and untouched North Korea, the one I am sure the Party would rather tourists didn’t see. And we had complete freedom to take photos and video, contrary to what most articles point at and contrary to what we had been told. Perhaps we were outliers, lucky even, or we won our guides over with our candid, warm and polite manners, but I certainly felt as if we had a unique glimpse into the lives of regular North Koreans from all walks of life. After all, as with most of the least visited places in the world, people are people everywhere and bad governments or shameful politicians do not represent countries. As I have my farewell dinner alone, because my friend got food poisoning, I feel that it is time for me to ask the questions I have been storing in my mind for the last six days. She casually asks about my job. “What does Google do?” Asks my guide, “And what is the Internet system”. I try, as best I can, to explain the world developments in the last few decades with simple words but I can see that she is not fully understanding what I mean, even after using the analogy of the gigantic library we visited earlier in the trip with their conveyor belts pulling books out of the shelves for the ability to Search. Curious, I finally gather the courage to ask more personal questions, about boyfriends and family. But my inquiry gets lots in translation and she understands that I am implying if she ever found a lover in one of the tourists she has guided, “Oh no, that would be impossible, we do not have email here!”. I was trying to ask if they get involved with other guides, as they spend so much time together and, after all, they have little opportunities to interact with anyone else, constantly going from one tour to the next. But it is clear that she has thought about the tourist connection and discarded the option. The “mosquito-net” that is often used to refer to the country’s media control permeates even over the only North Koreans with any opportunities to interact with the outside world.